The ruby-throated hummingbird is the most widely distributed and commonly recognized hummingbird in North America. It is the only hummingbird species to regularly breed in the eastern United States and its colorful green and red plumage is instantly familiar to many birders. The ruby-throated hummingbird is easy to identify by range, but in areas where this bird does overlap with other hummingbird species or where vagrant sightings are possible, birders should be familiar with the key field marks and characteristics that make this hummer distinct. Markings: Males have a black face and a bright red or red-orange iridescent throat, though the throat may appear dark or dull in poor light. The chin and throat are white, and the chest is gray-white with a vest-like look. Upperparts and head are bright green, and the wings and forked tail are darker green-black. Females have plain white underparts with a slight buff wash on the flanks and very faint throat streaking. The upperparts are green, but may not be as brilliant as males' plumage. Female birds have white tips on their rounded tail feathers and lack the deeply forked tail of males. Juveniles are similar to adult females but young males develop red iridescent spots on the center of their throats late in the summer. Like all hummingbirds, ruby-throats drink nectar and eat insects for protein. They may also sip at sap wells that woodpeckers have drilled, and will pluck spiders from their webs. These hummers happily visit nectar feeders as well as hummingbird gardens that are planted with nectar-rich flowers from spring through fall. Ruby-throated hummingbirds are common summer visitors in the eastern half of the United States as well as southeastern and south central Canada. The birds can be found in deciduous forests, parks, gardens, and yards, particularly areas with colorful flowerbeds and flowering hedges. Ruby-throated hummingbirds migrate to Central America as far south as Panama in the early fall, crossing 500 miles over the Gulf of Mexico without stopping. A few records are made annually of these birds migrating along the Texas coast instead of over the Gulf of Mexico. Some ruby-throats stay in the southeastern United States year-round in mild winters or if abundant supplemental feeding and flower sources are available. Vagrant sightings have been recorded on rare occasions far outside the typical range, including records in California. Ruby-throated hummingbirds are not commonly vocal but do have a high pitched, sharp chatter and sharp, high “pips” they will use when threatened or during courtship displays. Chase calls have a buzzy quality. A moderate hum sound is also generated by the wings in flight. Ruby-throated hummingbirds are strongly attracted to red and orange colors, as are most hummingbirds, and will hold their tails still while hovering to feed. Both male and female birds will use acrobatic aerial displays to defend their roughly quarter-acre territory. These birds become more aggressive near food sources as they prepare for migration in late summer. When agitated, they may initiate dive displays to ward off intruders. Ruby-throated hummingbirds are solitary birds that only come together in pairs to mate after males perform courtship displays that include large arcs with buzzing at the lowest point. These hummingbirds are polygamous, and males may mate with several females. Pairs will produce 1-3 broods of 2 oval-shaped, plain white eggs each per year. The female parent will build the thick cup-shaped nest lined with fine plant fibers or down and trimmed with moss and lichens for camouflage, placed 5-20 feet above the ground. She incubates the eggs for 10-16 days. After the eggs have hatched, the female parent cares for the nestlings for 15-22 days until they are mature enough to leave the nest. Male ruby-throated hummingbird parents play no role in caring for the eggs or chicks. 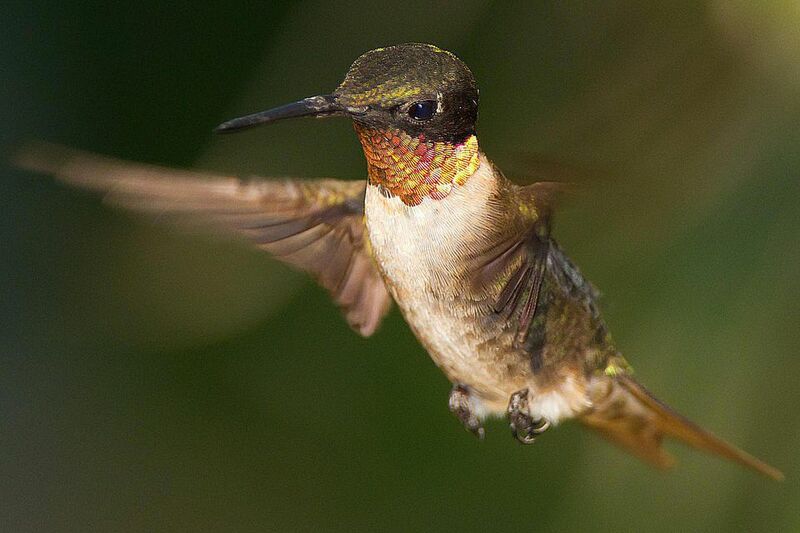 Ruby-throats will occasionally hybridize with black-chinned hummingbirds where the ranges of the two species overlap. Hummingbirds are highly desirable backyard visitors. Ruby-throated hummingbirds can be attracted to nectar-producing flowers, particularly red blooms such as red columbine, bee balm, phlox, trumpet creeper, and lilies. Birders can also hang nectar feeders to offer additional food sources and limit the use of insecticides to give hummingbirds a healthy insect food supply. Ruby-throated hummingbirds are also attracted to active water sources, such as misters, drippers, and shallow fountains. These hummingbirds are not endangered or threatened in any significant way, though they are at risk from a variety of threats. Outdoor and feral cats, window collisions, and insecticides are the biggest problems facing ruby-throats. In their wintering grounds, habitat loss can be a concern.